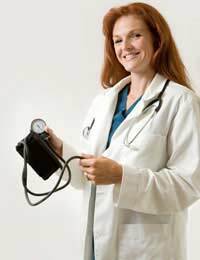 Normal blood pressure in an adult woman is 120 over 80, with the first value being the systolic pressure and the second the diastolic pressure. A blood pressure reading of more than 140 over 90 or a low blood pressure reading, particularly if the diastolic pressure is less than 70, can indicate potential health problems. Although high blood pressure is often associated with middle aged men, older women are just as likely to have it, and pregnant women can suffer dangerously high blood pressure. In women, the symptoms are the same as in men – there aren’t any. This is why having high blood pressure is often referred to as a ‘silent killer’. When the blood pressure is high, the heart has to work much harder to push the blood around the body. In older women, high blood pressure is a common cause of heart failure. This happens when the heart cannot pump the blood around to the tissues and back again very efficiently. Large amounts of fluid build up in the tissues, mostly in the lower legs, leading to swollen ankles and feet. High blood pressure can also lead to kidney problems and heart attacks because of the greater pressure on the organs and blood vessels. Regular monitoring is essential and you can do this by having regular checkups with your GP. Women on the contraceptive pill have their blood pressure checked when they get a new prescription, and women who are pregnant are also checked very often. If you are older, perhaps after the menopause, it is easy to get out of the habit of having regular checks and blood pressure can start rising without you realising it. Home blood pressure monitors are now commonly available but it’s important to choose one that has been validated. These are a bit more expensive – your pharmacist or doctor may be able to recommend one – but they are still likely to cost around £25-£30. With a bit of practice, you should be able to take your blood pressure easily and record it about once a week. If the blood pressure is not too high, it can be treated by lifestyle changes. The single greatest risk factor for high blood pressure is weight gain. If you are overweight but can join a club or start to eat more healthily and take some exercise, losing weight can make your blood pressure drop back to normal. Doing regular exercise is also important in itself, as is reducing the amount of alcohol and salty foods that you drink. If none of these measures work, it is important to see your GP to get some medication to bring your blood pressure down to normal limits so that you can avoid damaging your heart and kidneys. You can carry on with the lifestyle changes and, eventually, you may find you can come off the blood pressure drugs. Around one if four women develop high blood pressure after the 20th week of pregnancy. It usually returns to normal after the birth, but special care needs to be taken because high blood pressure can lead on to a serious illness called pre-eclampsia. If a woman has high blood pressure in a first pregnancy, it is more likely in a second or subsequent pregnancy. Sometimes bed rest or a hospital stay is required – the drugs normally used to lower blood pressure cannot be used in pregnant women because they travel through the placenta and affect the baby. Low blood pressure is much easier to spot as it tends to cause dizziness or even fainting when you go from a lying or sitting position to standing up. Leaping to your feet can cause lots of black stars in front of your eyes. Low blood pressure can lead to poor circulation, and your hands and feet may be cold most of the time. Again, lifestyle changes can help – drinking plenty of fluids, doing more regular exercise and eating a bit more salt can all help. If you have naturally low blood pressure you need to be careful when changing position – it may help to raise the head of your bed by a few inches, or to use more pillows at night so that getting out of bed is easier. Just rising slowly can also help, as it gives the heart time to start pumping blood hard enough to reach you head before you reach a full standing position.